Bertone: gone. Italdesign: Volkswagenised. Pininfarina: part of the Mahindra conglomerate. The Italian carrozzerie have seen better times than today, that much is certain. Quite a lot of that is to do with a certain bejumpered CEO, but flexible production methods and the industry-wide trend to establish in-house styling expertise also play important roles. With the days of the grand Italian styling houses numbered, it would be foolish to expect another Pininfarina-designed production Ferrari or a Bertone-penned Lamborghini to ever make it to the streets again. We’ll have to make do with designs courtesy of the respective in-house teams, currently headed by Flavio Manzoni (Ferrari) and Mitja Borkert (Lamborghini). A Lamborghini Aventador S, somewhere in the real world, photo (c) Lamborghini S.p.A. Whereas the latter hasn’t got any track record yet at Lamborghini (being most famous for the shape of the Porsche Macan), Manzoni’s Ferraris haven’t been heart-stopping affairs, hyper exclusive LaFerrari included. But credit where it’s due: the most recent effort of Borkert’s predecessor, Filippo Perini, must rank among the most ridiculous cases of defamation in automotive history. 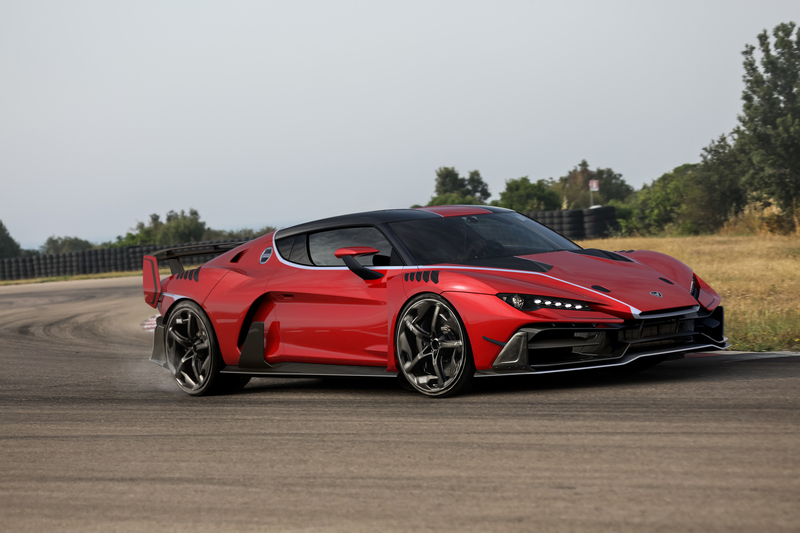 The Italdesign Zerouno certainly bears no hallmarks whatsoever of Giorgetto Giugiaro’s former enterprise. Which is, in a sense, quite some achievement, but a shameful one nonetheless. ‘Italdesign’ Zerouno, photo (c) Italdesign S.p.A. So, in a nutshell, the corporate approach to styling hasn’t done the Italian thoroughbred sports car maker many favours. Which could be attributed to changing times and tastes. If only there wasn’t Ken Okuyama. Okuyama-san is, for those unaware of the man, the superstar among Japanese designers. His own design consultancy has helped shape furniture, tableware and Shinkansen trains. The coach building arm of Ken Okuyama Design meanwhile built a handful of limited production sports cars, mostly Lotus Elise-based. These cars are the Kode series. Before he embarked on establishing his own design business, Okuyama had been, among other posts, chief designer at Pininfarina. Okuyama, who is trilingual, had overseen cars as diverse as the Ferrari 612 Scaglietti, Ferrari Enzo and the Maserati Quattroporte V during his Turin stint. Bearing this background in mind, one could come to the conclusion that Ken Okuyama knows his Italian design. With the unveiling of his new Kode 0 flagship model, this conclusion is proven to be fact. One does not need to compare the Kode 0 with its Lamborghini Aventador base car to be impressed. But it helps. Whereas the Lamborghini is a typical Perini-era effort in that it’s slightly overwrought and heavy-handed, which results in it being hardly as charismatic as its extreme proportions and form language would suggest, the Kode 0 understands that a dramatic design needs to be staged. Too much shouting results in white noise. However, more muted shouts are all the more effective if they occur during a stretch of silence. Which is why the Kode 0 is far more reduced a design. The creases and feature lines it does boast all serve a clear stylistic purpose. This results in a supercar that’s far more dramatic for its relative simplicity. And a supercar that can get away with metallic green accents. In cinematic terms, the Aventador is a Michael Bay movie: loud, conspicuous, overloaded with effects. The Kode 0, by comparison, is a James Cameron blockbuster. It may not be subtle, but it knows that good staging isn’t about the number of explosions per minute. Hopefully, the next time one of the Italian sports car makers intends to produce a spectacular halo model, they’ll give Okuyama-san a ring. He knows a thing or two about Italian design. The Zerouno is just… I mean… what the actual is that? Normally I can find at least one element, be it concept or detail, worthy of praise in almost any car. It has been a genuinely long time that I am truly stumped on that front, but Perini has managed it. I never was a particularly big fan of Okuyama’s Pinin stint – the Enzo does nothing for me whatsoever, I thought the 612 was absolutely dire, and it took me a while to warm up to the QP V’s charms (although I must say it looks way better these days now that the alternative is the current QP). But the article is spot-on that the Kode 0 innately channels the DNA of the supercar’s, and wedge doorstop design’s, peak decade, even if it owes a LOT to the Zero. Something similar has happened at Peugeot since they stopped using external consultants. Is one consideration the simple matter of security? Back in the day, a camera was a relatively unusual thing and the “data” for a design was the clay model itself. These days a design can be leaked in the time it takes to send an SMS or to dump a screen shot onto an email. That aside, there were downsides to the carrozzeria not least the kind of thing showed at another strand here: the recycled design. If the Carros did some good work they also ruined their reputations by offering Daewoos to Citroen and Maserti and offering Citroens to Skoda or simply by not knowing what a brand stood for so that even if they *meant* to do a Rolls it still looked like a big Fiat. The simple theory is that the current lot of designers are not very good at making memorable products for reasons that might be beyond their control. The carrozzerie were good at certain cars and not so good at others. Supercars, compact cars, coupés, roadsters,medium-to-large saloons, Ferraris, Maseratis, Peugeots, Fiats were what they excelled at, whereas they struggled with compact saloons, estates, MPVs, Jaguars, Rolls-Royces and Mercedesses. There were sectors where the carrozzerie’s know-how was second-to-none, the supercar class among them. They weren’t best at styling any kind of car, but a certain kind of car. I shall reuse the tired example of the Maserati Quattroporti V vs VI. What does one want from a carrozzeria? Is it a distinctive look that is not wholly like the brands it´s for? Or a car that fits right in with the existing and projected range? When they did a distinctive theme there was the risk it was distinctive because it simply looked like a product from another range. The carros lost a lot of their raison d’etre when they stoppped being able to make smaller to medium-sized runs. That meant they were as constrained by price/production methods as their clients. Think of the Lancia estates which were made in a more labour-intensive way. As soon as the carros had to use mass production-type designs they lost much freedom to do something a cut above. They ended up as stylists only and those people can be bought for €40,000 a pop and simply housed, watered and fed in a normal studio. This is about the link between design and production, isn´t it? I read a piece quite recently that offered an alternative and, I think, valid assessment of the various carrozzerias’ predilection for recycling. It made the point that when one commissioned a Pininfarina or an ItalDesign to design a new car, implicit in that contract was an understanding that one was getting not merely a physical design but the distinct design philosophy of the carrozzeria that came in tandem. We tend to think of the various coachbuilders as being in competition, and of course that is true, but to frame it exclusively in this way overlooks that Bertone had a decidedly different approach to say, I.DE.A or Pininfarina. There is no way the X1/9, for example, could have come from the pen of Pininfarina, in the same way that it is inconceivable to imagine Bertone being responsible for something like the Florida. When people say the BMC Farinas are a recycled 404 or pastiche Floridas, this is to miss the point – the similarity in appearance and philosophy was part of the reason they were awarded the contract. If one wanted a different approach, there was hardly an absence of choice. This is true even of ItalDesign, probably the most flexible and in some ways the most avant-garde of all the carrozzeria – the discussion here around the Porsche 932 made the point that it could not be anything but Giugiaro’s hand. I tend to think the decline of carrozzerias goes hand-in-hand with a generally increased aversion to risk on the part of the OEMs. An external designer like a Giugiaro makes most sense if you are prepared to give them as free a hand as possible. Once you are commissioning them to design what is already in the PowerPoint presentations of your product managers, you are getting closer to the point where you might as well save the royalty fees and assign it in-house. Stradale: the idea of designer pointed out there is a good description. What has changed now is that designers are much less likely to work according to their personal preferences; instead they try to find out what the customer wants and then provide it. Once that became the approach the differentiator lay in the level of technical competence needed to create the desired product. The definition of the product comes from the customer; old-school design houses imagined what the customer might like. Incidentally: the Lamborghini Photoshop setting is truly horrible. I was in Photoshopistan last year for a short vacation and there was lens flare everywhere and the place was saturated. I was told by those who’ve been there that it’s a rather sterile place. And there are almost no people either, or other cars. FitzVanland is an altogether nicer place. Few people, yes, but the ones you see there are looking really good! Also, implicit in the carozzeria concept is the knowledge of fashion and trends. These cars aren’t so much designed as fashioned, and when someone asks for a Pininfarina design, they ask someone in the know of what’s currently fashionable with the implicit suggestion of adding some of those design cues to the design. Designing a Maserati or Lamborghini is haute couture even though they are made in factories. But it isn’t any lesser work to design a car for pret a porter. When Italdesign designs and productionalize a Hyundai the objective isn’t high fashion but effective and pragmatic production. And it is a real challenge making a good small car of high quality. So much better if the couturier could leave a fashionable statement at the same time. Ferrari and Lamborghini has gotten stuck in the boyracer crowd, their entire line up is catered for twenty something millionaires spending daddys money and footballers. The design language is overtly masculine and aggressive, the ideal seem to be the look of a jet fighter. But there’s no beauty in it anymore, and no fashion statement. The Countach and 288 GTO managed to look both extremely aggressive and beautiful at the same time, but their making was also overseen by the single hand of their respective designer. What Okuyama has been able to do is to reintroduce the sense of fashion into car design, his Lamborghini is as strong a fashion statement as the Countach ever was. Almost like it Bertone had designer for this century, it reminds me of the Lamborghini Bravo. Wasn’t the carrozeria’s insight intuitive and the cost of failure comparatively small? Now that they don’t have production lines they’ve lost the tacit knowledge that distinguished them from any group of seasoned designers. In some defence of Lamborghin and Ferrari their customers’ tastes may have changed.